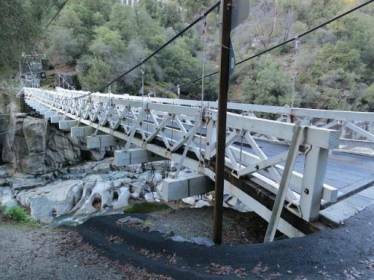 In 1939, a wire suspension bridge measuring 245 feet in overall length was built over the South Fork of the American River on Mosquito Road. The bridge is a 9-foot wide, one-lane limited capacity timber suspension bridge with a 140-foot long span. The bridge is crossed daily by approximately 1,300 vehicles. Emergency vehicles are restricted from using the existing bridge due to the narrow bridge width, multiple hairpin curves and steep grades, resulting in delayed emergency response time. In 2010, an inspection was conducted as to the overall condition of the bridge. The deck condition and the superstructure condition were deemed to be in fair condition and the substructure condition was very good, however rehabilitation of the bridge was still recommended due to substandard load carrying capacity. In April 2011, El Dorado County received federal authorization to complete the planning and environmental phase and scope the project. Now we can fast forward to early April of 2013. 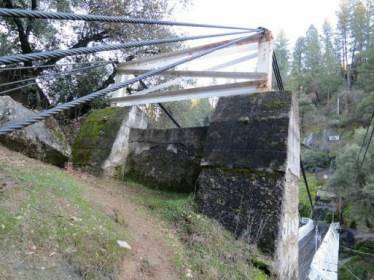 Portland Bolt was contacted by the County of El Dorado about manufacturing the bolts required in the rehabilitation of the Mosquito Bridge. The list of required fasteners was a mix of long rods, 7/8” in diameter in lengths up to 88” and headed bolts ranging from 1/2” diameter to 3/4”, all meeting the ASTM A449 specification. Needless to say, they were anything but standard. The fastener requirements also included A307 Grade A timber bolts and A36 square plates which Portland Bolt fabricated in-house. Because the job was federally funded, all of the fasteners, including their associated nuts and washers, needed to be 100% melted and manufactured in the United States. Another requirement, which fell right in line with Portland Bolt’s manufacturing capabilities, was the requirement for all fasteners to be hot-dip galvanized. Since all of the manufacturing procedures required, including hot forge heading and hot-dip galvanizing are performed in-house, Portland Bolt had no issues getting the parts made and shipped to the jobsite as promised in El Dorado County, California.